Virginia Campbell says she can't live alone. At age 87, she can't open a jar, has taken nasty spills just walking around the house and doesn't even trust herself to drive beyond her neighborhood, the age-restricted Sunland Village in Mesa. The perfect solution seemed to come by having her 37-year-old grandson live with her as a caregiver. Campbell's homeowners association says she can have somebody live with her - just not her grandson. The homeowner association rules let an adult child live with a parent who is 55 or older - but not a grandchild. It may seem a small detail, but Greg Campbell must leave by the end of the year to prevent a $1,000 fine, plus $25 every day he continues to live there. Virginia Campbell and her family are trying to fight the HOA, but she is worried she may lose and be forced to live alone. "It's a shame that when your family wants you to have help, somebody says you can't have it," Campbell said. Virginia Campbell, 87, holds a picture of her grandson, Greg Campbell, who has been living with her as a caretaker at her home in Mesa but is being forced to leave by her HOA. Sept. 11, 2009. Campbell, even bought the home - and has tried to argue Greg Campbell can live there because Greg is his son. The association also has rejected that. "If he's not actually living with his parents, he doesn't qualify for that exception," said Jason Smith, an attorney with Carpenter, Hazlewood, Delgado & Wood, who represents the association. "It may sound really convoluted, but that's the technical bickering we've gotten ourselves into about the case." It was another bit of bickering that seemed to trigger Sunland Village's attempt to remove Virginia Campbell's grandson. One April morning, Virginia Campbell's neighbor was wheeling out his trash can early in the morning, and Greg Campbell asked if he could do it later in the morning because of the noise that echoed between the houses and woke his grandmother. The neighbor reported the grandson's presence to Sunland Village, according to a memo from the association. But the neighbor told the Tribune he never complained about Greg Campbell's presence and thinks the HOA should drop the matter. "I have no issue with it at all," Chuck Spears said. "As a matter of fact, I think it's good for Virginia." 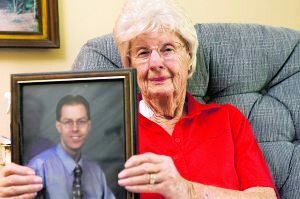 Greg Campbell has lived with his grandmother since 2006, shortly after her husband of 65 years died. Virginia Campbell said she needs her grandson in the house because she's had to have him take her to the emergency room several times, and she relies on him to clean and do other household chores. She stays active with bridge games and some golf, but said she mostly gets around on a golf cart and needs her grandson to drive her to the grocery store. Virginia Campbell got a letter from a cardiologist in 2006 that recommended in-home care, and she shared that with Sunland Village. She said she was surprised it's become an issue after three years. "This community should give him a medal instead of kicking him out," said Pat Haruff, another Sunland Village homeowner who has successfully championed HOA reform bills at the Legislature. She is president of the Coalition for Homeowners Rights and Education, and said she thinks the community is selectively enforcing its rules. Sunland Village is enforcing its codes, covenants and restrictions because it's legally obligated to, Smith said. He noted the association has offered in writing to hold a hearing that would determine if Virginia Campbell is considered disabled under the Fair Housing Act. If she is, Sunland Village could grant an exception for Greg Campbell to provide care, he said. The community's more than 2,685 homes are restricted to residents 45 and older, and to spouses of any age as long as at least one is 55 or older. Single children 18 and older can also live with a parent who is at least 45. Chuck Campbell said he hasn't pursued a hearing because his attorney doesn't believe Sunland Village has a legal right to ask for anything but the letters from doctors that he's already provided. He's still conferring with his attorney to see what the latest effort will be. Chuck Campbell said he didn't buy the house to get the exemption for his son, but rather to help his parents financially. The sale was set in motion in 2000, when they began making payments, and closed in April. Virginia Campbell said she can't imagine moving and can't afford an assisted living facility. The battle has shaken her and is an exception to an otherwise ideal retirement that began in Sunland Village 28 years ago. "I had wonderful memories of this place, and too bad it came to this," Campbell said.